You know when you're sitting in chemistry, and biology... physical science, thinking when am I going to use this in real life. Science totally = beaker for me in my brain. Now in grad school, as I think of research questions, I realize that most things we do consists of using science. Even our make up... actually ESPECIALLY our make up. I'm going to talk about the science of color matching another day, today I'm going to talk about eye shadow color science. Remember the color wheel from elementary school art class? Well, it shows us what colors compliment each other. Look at the color directly across. Purple and yellow, which makes me think of middle school, go Chinook! Green and Red, oh Christmas tree... blue and orange. Well when you get down into the deeper tones of the color wheel you can figure out which colors are going to make your GORGEOUS eyes pop. Also amazing, these are magnetic. So if you run out of one, you don't have to replace your whole compact!!!! 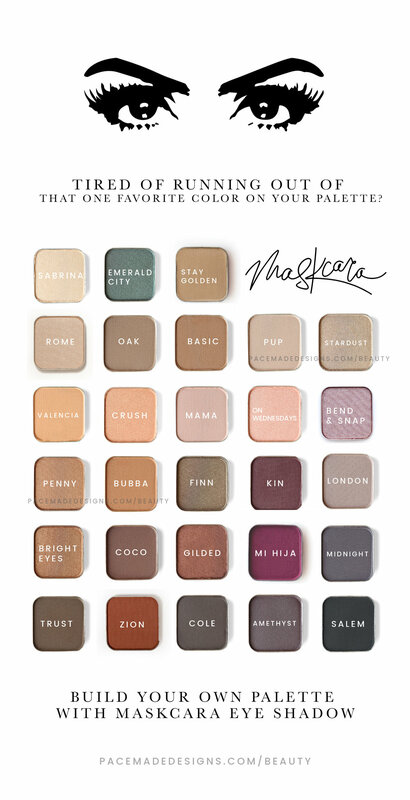 And you can build your very own palette filled with colors YOU love. Are you ready for the wheel already?? Our shadows are super pigmented, if you want to fill in your brow with powder then grab one of the matte shadows to double serve. To get started pick four colors. A highlight or base, mid tone, dark and then an accent. You can choose as many colors as you want within your eye color column, or choose neutrals. The accent color should be from your eye color column to make that color POP! So if I was going to choose neutrals + accent, I could choose Sabrina, bright eyes, trust and then gilded to bring out the green. You see, all of my colors don't have to come from my color column, those just give you lots of choices to emphasize your eye color! Kale Chips were my saving grace!